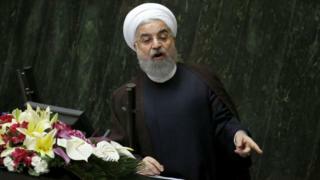 Image caption Hassan Rouhani said that under Donald Trump the US was not a "reliable negotiator"
But the US says Iran's missile tests have violated a UN resolution. The resolution endorsed the nuclear deal and called upon Iran not to "undertake any activity related to ballistic missiles designed to be capable of delivering nuclear weapons, including launches using such ballistic missile technology". US President Donald Trump has repeatedly threatened to pull out of the nuclear agreement, and after a missile test at the end of January his administration declared that the US would no longer turn "a blind eye to Iran's hostile and belligerent actions". While acknowledging that the test was "not a direct violation" of the nuclear agreement, it imposed sanctions on 25 individuals and entities connected to its missile programme and the powerful Revolutionary Guards force. 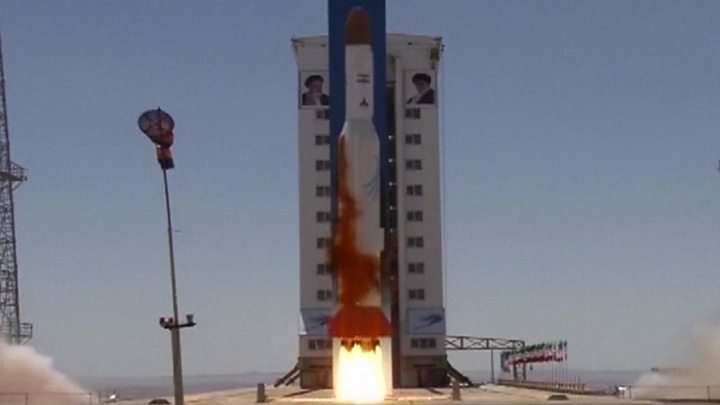 Further sanctions targeting six Iranian companies were announced in late July following Iran's launch of a rocket capable of putting a satellite into orbit. And earlier this month, Mr Trump signed into law a bill passed by Congress that requires the president to impose sanctions on individuals facilitating Iran's ballistic missile programme, "foreign persons that are officials, agents, or affiliates" of the Revolutionary Guards, and on those responsible for human rights abuses. On Sunday, Iran's MPs responded to the move by voting overwhelmingly in favour of legislation to increase the budget for the country's ballistic missile programme and the Revolutionary Guards' external operations arm, the Quds Force. In a speech to parliament on Tuesday, Iran's president stressed that Iran wanted to abide by its commitments under the nuclear deal, which he called a "model of victory for peace and diplomacy". But he warned that this was not the "only option". "Those who try to return to the language of threats and sanctions are prisoners of their past delusions," Mr Rouhani said. "If they want to go back to that experience, definitely in a short time - not weeks or months, but in the scale of hours and days - we will return to our previous situation very much stronger." He said the world had seen clearly that under President Trump the US was "not a good partner or a reliable negotiator", noting that he had said he would withdraw from the Paris climate accord and reverse parts of an agreement with Cuba. Trump administration sanctions Tehran - but what now?